The Marian Anderson Historical Residence Museum is the Epi-Center for the Life and Legacy of Marian Anderson. The understated exterior of the 19th century, 3-story Marian Anderson House at 762 South Martin Street (Marian Anderson Way- in-between 19th &20th & Fitzwater Street in Center City West Rittenhouse Square District ) bears a plaque from the Philadelphia Historical Commission. Declared a Historic Landmark by the state of Pennsylvania & The Marian Anderson Residence Museum has been placed on the National Register Of Historic Places by the United States Department of the Interior. Ms. Anderson bought the house in 1924, transforming the small basement into an entertainment center. The area included a portable bar stocked with champagne and water (Anderson’s favorite drinks), a few pieces of furniture and a piano. Here she would entertain friends and fellow musicians while resting up from world tours. Blacks during this time could not go out socially, so homeowners would enhance their basements to entertain friends. Ms. Anderson’s modest home contains rare photos, books, memorabilia and films about her life. The museum is run and maintained by The Marian Anderson Historical Society & changes its Exhibition theme every year giving visitors new and exciting perspectives on Marian Andersons amazing life. The organization was founded by Blanche Burton-Lyles and has existed for the past 20 years. 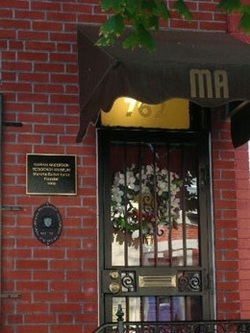 The society itself consists of The Marian Anderson Residence Museum. Beyond that, the area around these sites has been named the Marian Anderson Heritage Village, which proudly boasts flags around the neighborhood. Along with the Museum the Marian Anderson Scholar Artist Program is a major fixture that supports young Artists, classical & opera singers, instrumentalists, visual artists & more ages 18 -45 who are ambassadors of Marian Andersons Musical Legacy. These artists perform regularly for a season of shows & events that the society sponsors, and perform around the world. Book Your Group Tour Today ! We are pleased to announce that in addition to RSVP'ing and calling our offices or visiting us on our website you can now also Purchase Exclusive and Group / Organization Tickets for the National Marian Anderson Historic Residence Museum at the Independence Visitors Center located at 6th and Market street in center city Philadelphia. VISIT AND EXPERIENCE LIVING HISTORY! MAKE YOUR APPOINTMENT TODAY. Schedule your Summer Camp, School , Classes, Groups, Families and Organizations to Visit & Tour the National Historic Marian Anderson Residence Museum Today! Open for Tours Daily from 10am - 4pm Monday through Saturday. Please call to make a Reservation for your Living History Tour Today!